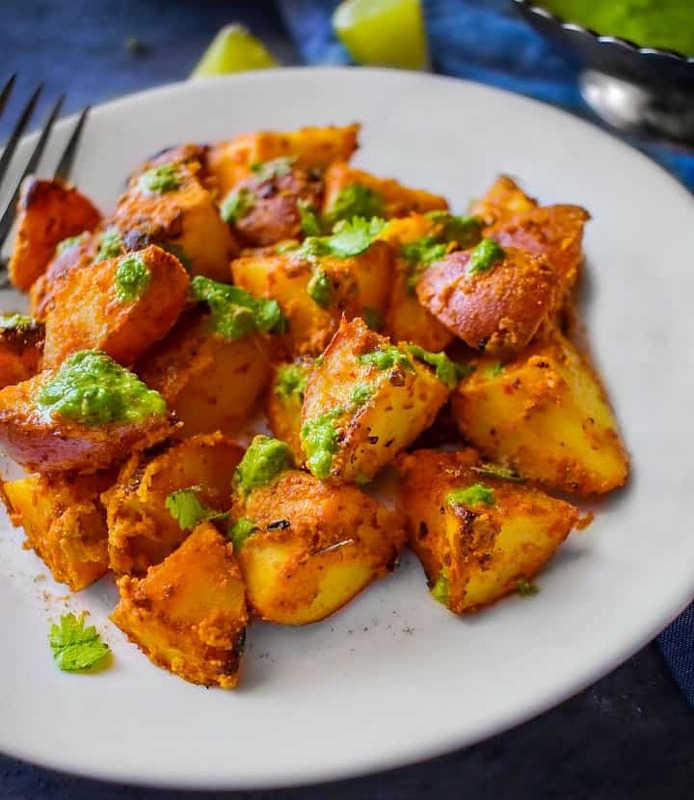 Tandoori Aloo (Air Fryer Tandoori Potatoes): melt in your mouth tandoori aloo / tandoori potatoes made using yogurt, spices, and potatoes in an air fryer. 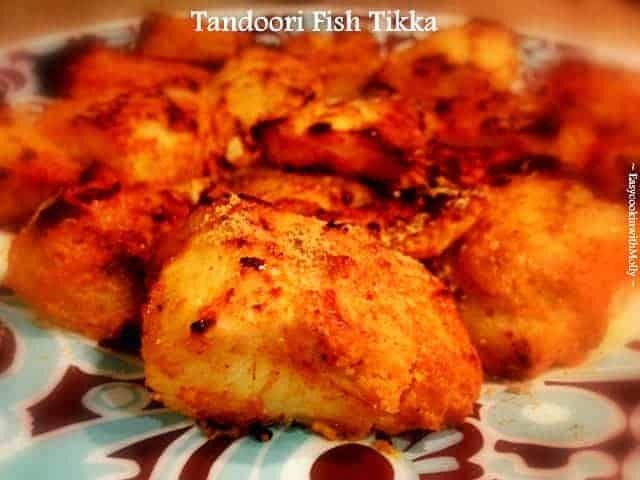 This recipe also talks about making the Tandoori aloo in oven. 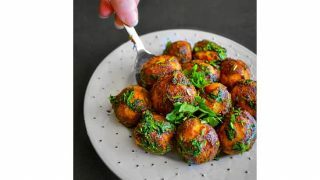 Tandoori Aloo, also known as Tandoori Potatoes is my favorite spring-summer recipe for weekend brunches or even parties/potluck. 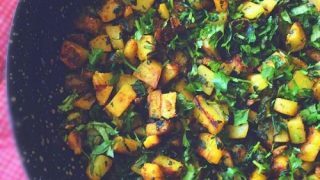 It’s nothing but potatoes marinated in a spicy yogurt+Indian herb-spice mix and then cooked in a large Indian clay pot tandoor or oven. 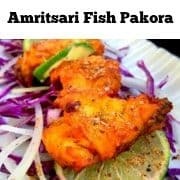 Extremely Popular Indian recipe and is one of the gems of Traditional Indian cooking. Make them on Stovetop (yep, its quite possible). As I had mentioned above, today we are cooking the aloo / potatoes in my most favorite kitchen gadget ‘Air Fryer’. The Biggest Benefit is Convenience. No preheating the oven and no heavy gadget involved. Less cooking time and the air fryer technology makes them evenly golden brown + crisp on the outside. 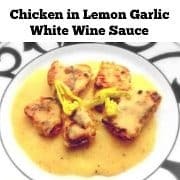 As easy the dish sound, there is one catch, you need the proper mix of herbs+spices to guarantee that delicious recipe everytime. You can use any kind of boiled potatoes. You Need to / Only use Thick or Greek Yogurt. you donot want any watery paste. Never and I repeat Never mix salt during Marination! (salt releases water hence if used in marination, will make the mix watery even before you start roasting these). 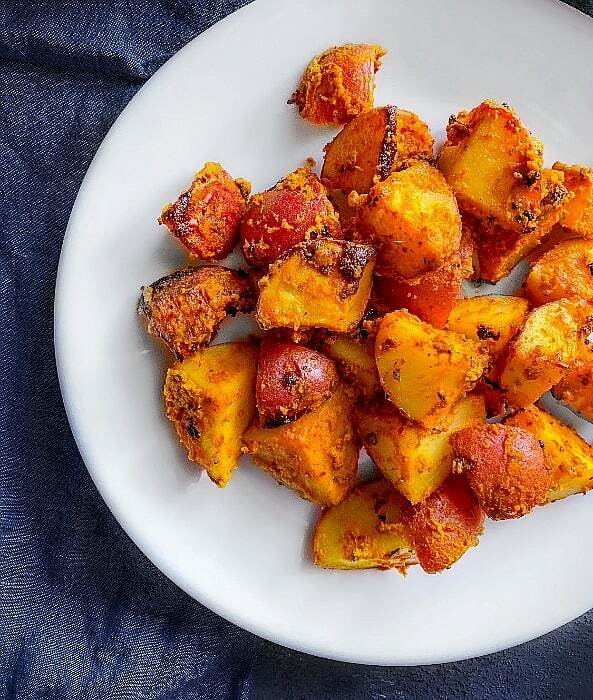 Never over-crowd the baking pan/air fryer basket or even the pan if roasting on the stovetop. Always dry roast the spices to remove that raw flavor and add smokiness to the dish. Fresh Lemon Wedges – nothing compares to fresh lemon juice on savory Indian snacks. 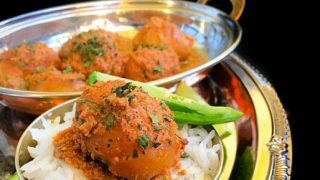 So, this weekend or for your upcoming part/potluck, try this Tandoori Aloo recipe and surprise everyone. 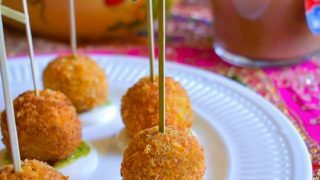 It’s also a great recipe to serve with drinks or for tea parties too. I usually make a big batch and save some for later use. 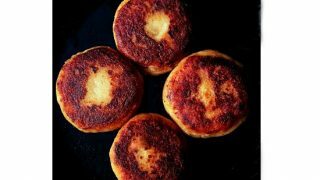 That’s the other benefit of Air-Fryer recipes that you can quickly heat them to their original taste. 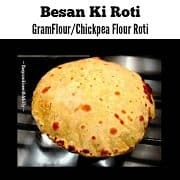 The recipe can stay in the fridge for upto 2 days. I would not suggest keeping it for longer as it contains dairy. Heat a small pan and dry roast the spices for a minute over low flame. (this removes any rawness from the spice and gives it a smokey flavor). Pulse the spices for a minute to make sure ajwain (carrom seeds) are powdered. 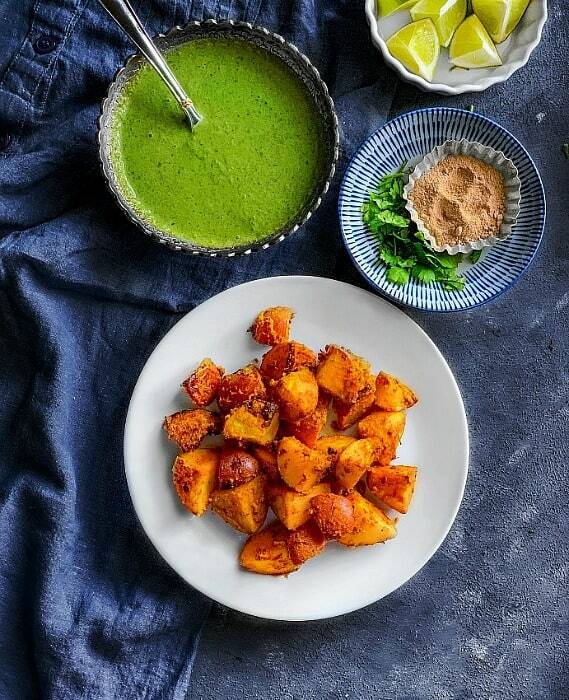 In a large bowl, add all the marination ingredients (yogurt, ginger+garlic paste, lemon juice, oil and food color). Now add the roasted spices and whisk everything to a smooth mix. 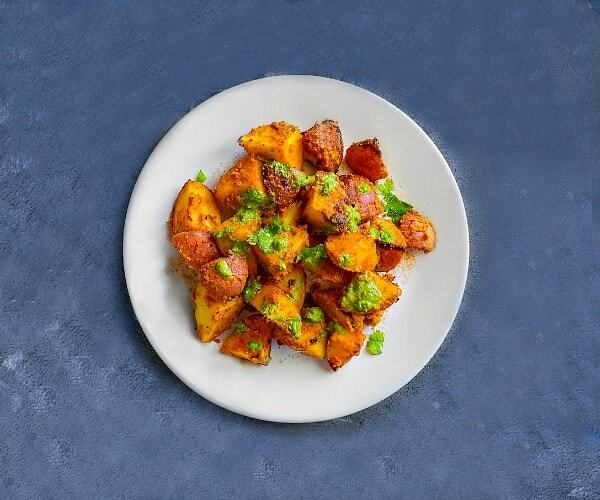 Add the boiled quartered potatoes and mix everything using a fork (make sure to coat each potatoes). 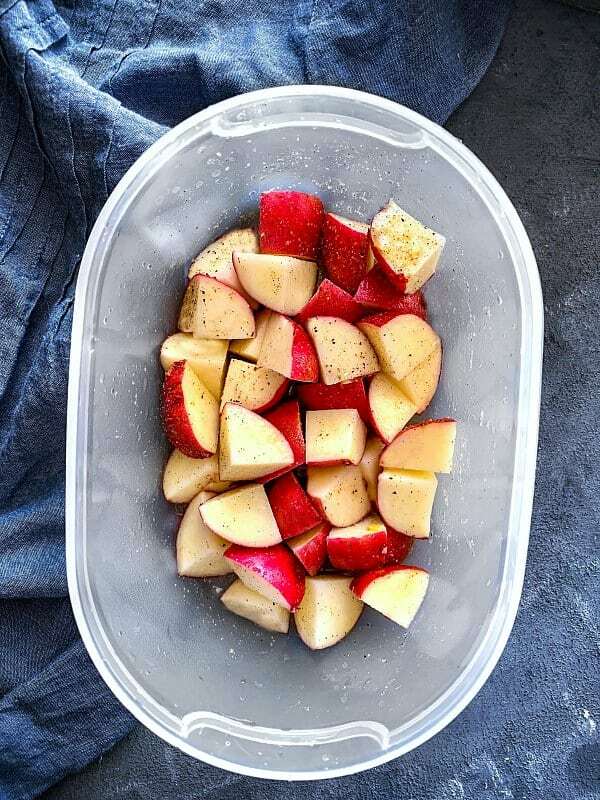 Cover the bowl with a plate or cling wrap and keep in fridge for minimum of 30 minutes to 4hrs. (this helps marinate properly). Place a foil on the bottom of the air-fryer basket. 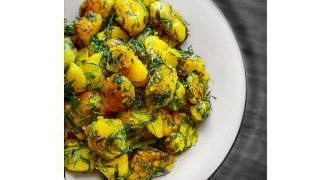 Remove the marinated potatoes from the fridge, add salt and mix using fork. 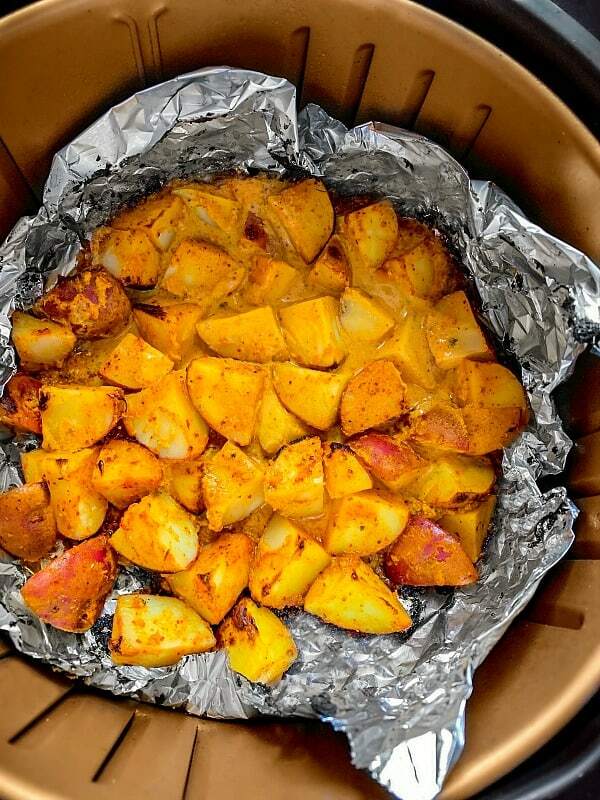 Transfer the potatoes to the foiled air fryer basket (you can do this in batches of 2). Spray cooking oil and air fry on 320 for 15 minutes. ( you can stop in between and turn the potatoes a little). After 15 minutes, the potatoes are cooked and some might be slightly charred but that's okay. Transfer the air fryed batch to serving plate and add the remaining batch to cook in air-fryer. After 15 minutes, remove the other batch too and transfer to serving plate. Line the baking tray with foil and spray evenly with oil. Remove the marinated potatoes from the fridge and place them with some gap on the lined baking tray. After 15 mins, set the oven to medium broiler setting . Place the cooked potatoes on the top rack of the oven and broil for 3-5 mins or till you achieve the desired charred look. (Please keep an eye as every oven is different and too much broil will burn the dish). Remove the broiled potatoes from the oven. 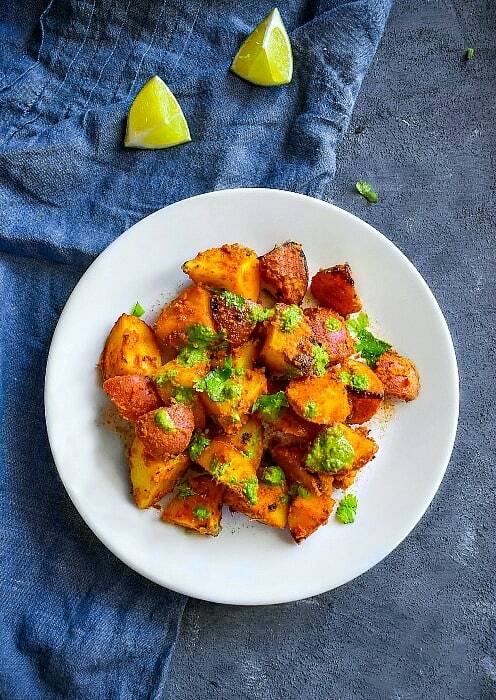 Place the tandoori aloo / tandoori potatoes in a large bowl. 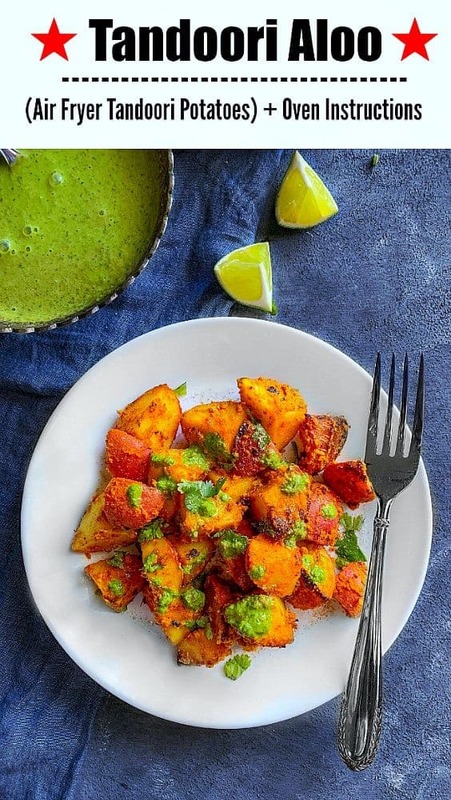 Sprinkle some Indian Cilantro chutney / Dhaniya Chutney on top. Squeeze some lemon juice and sprinkle some chat masala (optional). 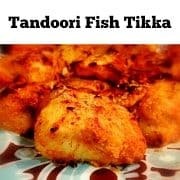 2 Replies to "Tandoori Aloo (Air Fryer Tandoori Potatoes) + oven instructions"
I just got an air fryer and was looking for simple recipe. 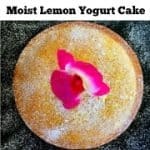 Just found this, looks so delicious and trying this Saturday.